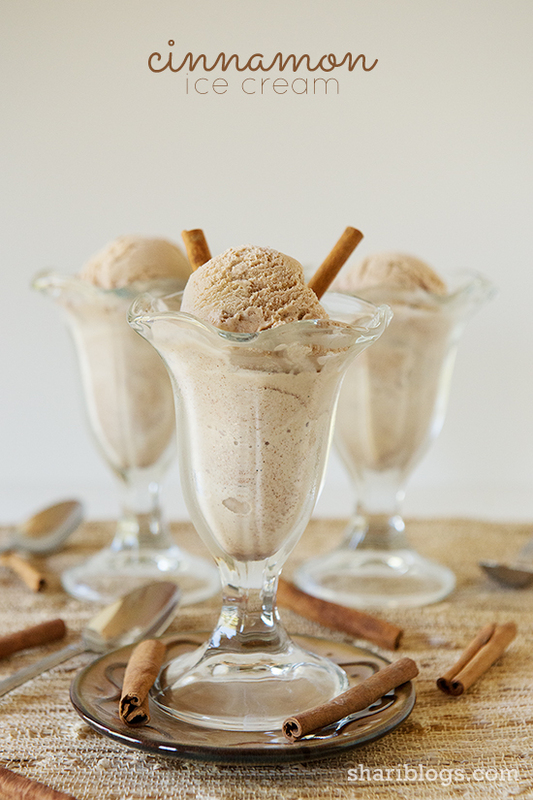 It’s no secret on the blog here that I have a serious love of all things cinnamon. I first fell in love with cinnamon ice cream at Cold Stone Creamery when we lived outside of Cincinnati. I would get cravings for their ice cream and make Eric take me into Cincy to get some. I always ordered a Cinnamon milkshake made with it. It was so good. Making ice cream with a Cuisinart Ice Cream Maker is so easy, but I always feel like supermom after I have made a batch. The kids love ice cream so they think it is awesome. We love thinking up new combinations to try. To be honest, when I first made this ice cream I had my doubts it would measure up anywhere near that of Cold Stone. My worries were for nothing. This ice cream is AMAZING!! I could have grabbed a spoon and just eaten the whole ice cream maker bowl full in one sitting. I even made a few of my Oatmeal Raisin Cookie Milkshakes using it. Oh my, those were heaven! I know that I say that everything I post is amazing, but that’s the point of this blog. I am not going to post it here unless it is tried and true and a favorite of our family. 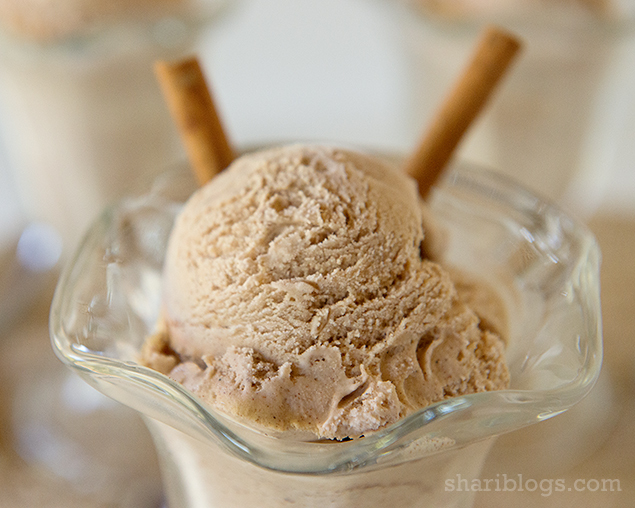 If you like cinnamon, you will LOVE this ice cream!! Pour into ice cream maker and prepare according to your ice cream makers directions. * I put mine in a freezer safe container and freeze for a 2-3 hours to harden up a little more before serving. If you don’t have an ice cream maker, you can pick up the same one that I have through Amazon. I highly recommend this Cuisinart Ice Cream maker. There’s nothing like a good batch of homemade ice cream. 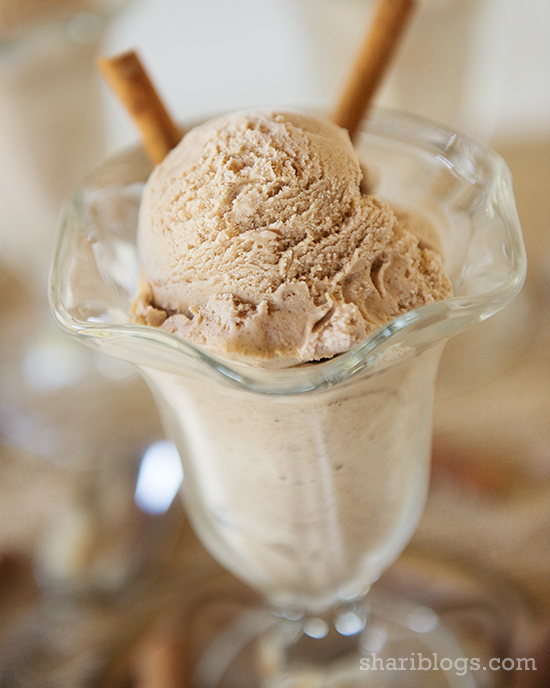 You won’t believe how much fun you can have with your own ice cream maker! I’ve got lots more fun ice cream recipes to come! Beautiful pictures! This looks to die for! Oh Becca… it would be AMAZING with apple pie. I think I might have to make that for my hubby and son this week! Great idea! 🙂 Thanks for stopping by!! Girl, you need to dust that ice cream maker off and get it churning!! This is definitely a great starter recipe. So yummy!!! Popping over from the PINcentive blog hop! This looks AMAZING! Pinned! Thanks so much for popping over, Kait! I hope that you will come back often! 🙂 Thanks for pinning!! Thanks so much for the pin, too! 🙂 I am off to check out your blog! wow – pinned this one. can’t wait to try it out. YES, you must go buy an ice cream maker. They are so much fun! We are getting ready to fire ours up again tonight. I can’t wait! I finally found my ice cream maker (buried int he basement),and then completely forgot to make ice cream! 🙁 This would be awesome with apple crisp!! Lisa, get that thing out and start churning out some fun ice cream recipes!!! We can’t get enough of it. I totally agree about the apple crisp with this cinnamon ice cream. It’s the perfect combination!! Oh yum, this looks super delicious! Pinning this cuz I definitely need to try it! Thanks so much for sharing the recipe at my link party! Thanks for pinning and stopping by, Jessi. Love your party. 🙂 Definitely make the ice cream. It’s amazing! Beautiful photos! I don’t have an ice cream maker right now, but I’ll have one after Christmas. This looks super delicious and I can’t wait to try it! Oh you will love your ice cream maker when you get it! It’s so much fun! Stopping by from the PINcentive Hop. I followed you on Google+, Pinterest, and Twitter. I liked you on Facebook. The ice cream looks delicious!! Betty, thanks so much following me everywhere. I appreciate it. Look forward to “chatting” with you more! Thanks, Jennie! I just checked out your blog and joined your party! 🙂 Thanks for the invite! 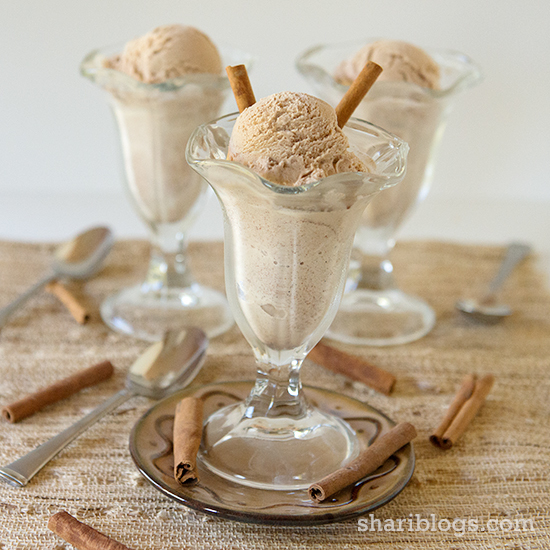 Cinnamon ice cream is my all time favorite! I have yet to make it at home but I must try this recipe, as it looks wonderful! Yay – a fellow cinnamon ice cream lover!!! You DEFINITELY need to make this! It is so delicious!!! This ice cream looks wonderful! Thank you for sharing this with the Less Laundry, More Linking party. Half and Half is a dairy product you can buy in your grocery store near the milk. It is half cream and half milk. If they don’t sell it in your area, you can easily make it with half whipping cream and half whole milk. “If you use whole milk, mix 3/4 cup of whole milk with 1/4 cup of heavy cream to approximate half & half. Just wanted to share that I pinned this the other week, made a little tweak and it was amazing! I had some apple cider that I’d reduced down into a thick liquid. I added that in about half way through the process with the ice cream maker and the finished product tastes exactly like apple pie ice cream! Thanks so much for this recipe, it was the perfect base for the cider! This ice cream was delicious. Of course I tweaked it a little by adding eggs into the mix to make it super creamy. Otherwise I did everything else I followed your recipe. SO GOOD! Thanks so much for letting me know that you tried it and loved it! That is my favorite ice cream to date!! Love it! I will have to try adding eggs too. How many did you add? I just got the same ice cream maker you have, and I tried this recipe for my first ice cream attempt, but it didn’t turn into ice cream! After half an hour, it was still liquid. I followed all the cuisineart instructions. What did I do wrong?? I am not sure what might have gone wrong. We make this all the time and I have never had a problem. I do know that sometimes I have to let the ice cream maker continue working longer than a half hour on many ice cream recipes. This recipe also comes out of the ice cream maker more of a soft serve type. As I stated in the recipe, I usually put mine in the freezer for a couple hours to let it harden up more if we want a more solid ice cream. I hope you try it again and enjoy it! I tried it again, thanks! I saved the ingredients (that were still liquid) in the fridge and refroze my cuisine art maker bowl to try again the next day and this time it worked! I don’t know if it just needed to go through it twice, or maybe my bowl wasn’t cold enough the first time. When I refroze it, I turned the freezer temperature all the way down. The only thing was, the cinnamon didn’t mix in very well. 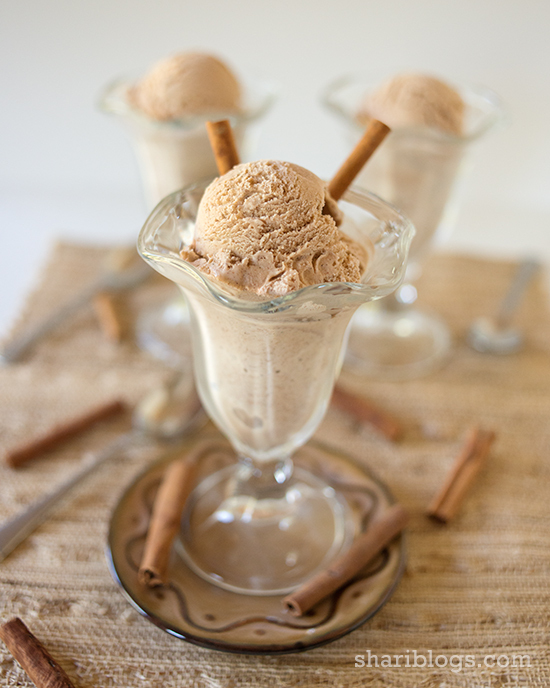 Some spots of ice cream had huge blobs of cinnamon and others had hardly any. I wonder if this is because the liquid sat overnight in the fridge? But it was still delicious! And a great texture compared to some other recipes I’ve tried since. Hi! Made this and loved it! So creamy and delicious and perfectly cinnamon-y 🙂 I think next time i will cut back on the sugar, but it was so so good. Also super easy which is always a plus . Thanks for the recipe! I made this fantastic recipe and it was to die for!!! I cant believe what we were missing!!! Sooo scrumptious & my hubby fell in love with it also. It is going to be frequently on the menu and a go to ice cream for sure!! If you haven’t tried this, it’s definitely a MUST try!!!!! Thank you for the fantastic recipe!!! *also, in a second batch I added 1 scraped vanilla bean pod, and a teaspoon & a half of GROUND super fine licorice root (from the stick), and halved the cinnamon. Delicious & Amazing!!! This is my favorite recipe for ice cream. Simple ingredients make it so easy! It is my favorite too!! Thanks for stopping by and letting me know you enjoyed it!